That's a shout-out to my Calabar peoples. I was quite delighted when I found this LP--Well, actually I didn't exactly recognize it, but I figured I'd pick it up since already had another Isaiah Dickson album and I dug the very modern cream-colored leisure suit he's sporting on the cover. When I got it home though, I found that I knew every single song on the album by heart! This whole album got a lot of play on Cross River Radio when I was in primary school. and transmutes them into a mean afrobeat groove. The album is immaculately produced by the legendary Chris Ajilo and is presented here in its entirety for your listening pleasure. Have I ever mentioned that Maxwell Udoh is one of my favorite Nigerian singers? I can't even make out what the hell he is saying more than half the time but there is something very appealing about the tension of his voice--the slightly hollow vocal timbre and plain-spoken, no-frills delivery. His burning sincerity was perfectly suited for the super-earnest style of Doves, for whom he sang lead vocals for a while (replacing Cameroonian singer Lawrence Nsoesie Ebanga, who died in an accident on the infamous Njaba Bridge in 1976) before going solo in 1982 at the age of 21. 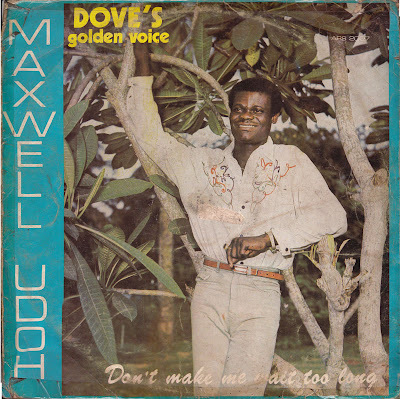 Maxwell Udoh was not the kind of singer who was ever really "cool"--in fact, he was always very "local" or "bush," if you will. But while you could talk all day about his lack of polish or suaveness as an artist, there was no way you could argue with the persuasive power of his highlife calypso dance anthems. In the late 80s, when reggae became the big thing, he dropped his trademark honorific "Dove's Golden Voice," and donned a beret and fatigues, billing himself as "Rasman Maxwell and his Masses Militia Band." Maxwell Udoh - "Let's Dance Together"
Maxwell Udoh - "Baby Bye Bye"
I just learned this evening that highlife musician Obiajulu Emmanuel Osadebe has died. 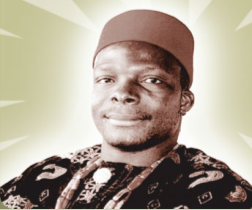 This development is made doubly saddening by the fact that it occurs less than two years after the passing of Obiajulu's father, the legendary Chief Stephen Osita Osadebe, and Obiajulu had taken it upon himself to keep the Osadebe legacy alive. The first son of the late highlife music maestro, Chief Stephen Osita Osadebe, Obiajulu, is dead. According to a family source, Obiajulu, 43, died on Tuesday at Niger City Hospital, Onitsha, Anambra State, after a brief illness. The body has been deposited at the Ozubulu Central Mortuary in Ekwusigo Council area of Anambra State. Although the cause of his death could not be ascertained as at press time, there were speculations that he died of heart failure. He had been bed-ridden for over five months at his Atani country home, Ogbaru Local Government Area, Anambra State. Obiajulu, who came back to the country after the burial of his father on February 8, last year, stepped into his father’s shoes, remixing some of his hit songs. He also performed at some popular joints within and outside Onitsha. Until his death, Obiajulu was married to Olayinka. Besides, he is survived by an aged mother, brothers and sisters. 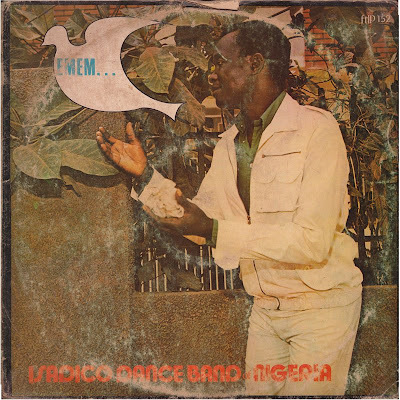 Unfortunately, I don't have any Obiajulu music on hand, so I'll put up some Osita Osadebe tracks instead. I would have liked to post the 1977 cut "Obiajulu" (which translates as "My Heart Has Found Rest") but I can't find the record right now. Instead, let's enjoy 1988's "Ana Masi Ife Uwa" ("I am telling the story of my life") in which Osadebe Sr. declares that music his gift from God, his destiny and the journey of his life--as it also was for Obiajulu, who earned a Masters degree in Banking and Finance but elected instead to follow his father on the musical journey. Chief Stephen Osita Osadebe & His Nigerian Soundmakers International - "Ana Masi Ife Uwa"
Flashback 1984: Smiley Culture - "Cockney Translation"
"Made in Nigeria" Part 8 up on Boogieheads! in heah! If you subscribe to the Boogieheads Show (and if not, why not?) then you probably heard this about three weeks ago, but Obafunkie has been having a little difficulty updating www.Boogieheads.com so November's show is still up over there. Until things get ironed out, you can check out the last episode HERE. To schedule automatic downloads of the Boogieheads Show, paste http://www.boogieheads.com/podcasts/boogieheadspodcasts.xml into your iTunes or other aggregator software. 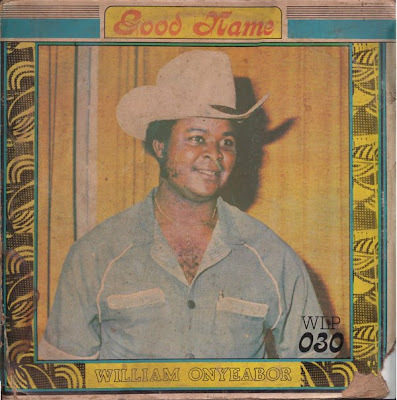 William Onyeabor - "Good Name"
Welcome to 2009, fam... I trust we all safely made the crossover and all are here and accounted for? Good... Then let's keep on doing what we do, yeah? The calendar may change, but the game stays the same! 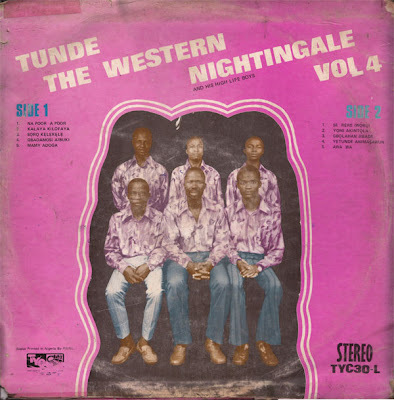 In the juju constellation, few stars have shone as resplendently as Tunde Nightingale's. Born Ernest Olatunde Thomas in 1922, he started his career during World War II but only rose to real prominence in the wake of I.K. Dairo's modernization of the genre. 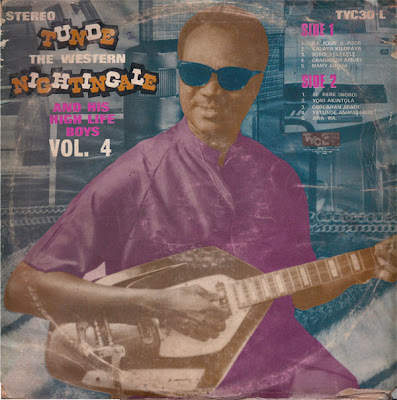 Nightingale was himself a transformative figure, shaping the context and presentation of juju from the 1960s onwards. 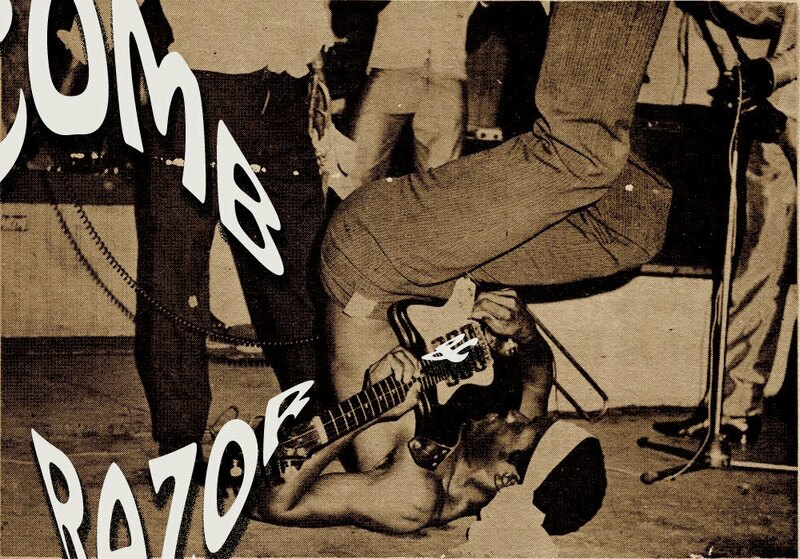 One of the concepts he is credited with popularizing was owambe--the ostentatious, marathon block parties rife with flagrant money-spraying and booty-shaking that have long been an essential feature in the social life of Lagos and other Yoruba urban centers. At these opulent parties, Nightingale would ask his well-heeled audience So wa n 'be? ("Is it there?" --referring to the paper money that they would be expected to plaster upon his face to reward his performance and illustrate their own affluence) and the audience would respond with O wa n 'be! ("It is there!") And so would the game go all night, with The Bird Who Sings At Night reeling out song after song and the merrymakers rained pound notes upon him until daybreak. [The elite audience] had decided, even when I. K. Dairo was at the peak of his popularity, against Dairo's brand of juju music. What was more, they were firm in their belief that juju music was for social parties and not for dance halls. and because Dairo was playing more at dances than at social parties, they decided that Tunde was the horse to back. They went all out to patronize Tunde and popularize his brand of juju music. And thus was the stage set for glitzy juju superstars like Ebenezer Obey and King Sunny Ade and their projection of the doctrine of "enjoyment" and conspicuous consumption as the central guiding force of the music. Tunde Nightingale recorded for several labels, but his most popular records would be the series of albums he cut for Take Your Choice Records. Here is Volume 4 of that series.